Pear whelks (Busycotypus spiratus) are cute little seashells and they can be colorful. They resemble the lightning whelk, before it grows big. 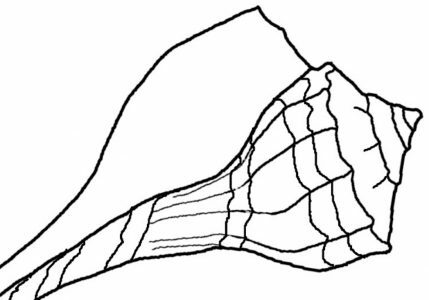 But the Pear whelk has it’s opening on the right side, like most gastropods. This one is also called a Fig whelk and it’s max length is 5.5 inches. In Florida it is common along any shoreline. In this first photo you can see the operculum (trap door) which is a hard piece that closes the mollusk up inside it’s home. The snail is beginning to come out of the shell because I picked it up from the shelly bottom where he had been resting quietly. I expected to see a hermit crab inside, and was delighted to see the creature who made the shell instead. This water is very shallow as you can probably tell, so he was living close to shore. I snapped this shot and put him back down without bothering him further. Above: Found this pear whelk while walking along a deserted beach in the backwater area of the ICW (Intracoastal Waterway). I’m guessing they prefer the calmer waters near the islands and that is why I never find them along the ocean beach. In the photo below you can see how shells can look in the wild. They are not all that pretty when covered in mud and slime. I knew the type by the shape of the shell. Yup, hermit crab inside. I’ve never collected one of these shells because every one I’ve encountered (except for the live one in my first photo on this page) has been inhabited by a hermit crab! The shells are small and easy to carry on the back of the crab. I just loved the pretty yellow color of this Pear. It stood out among the muddy bottom. It was moving along on the back of it’s new owner. Can you guess? Haha! Below you can see the crab peeking out. This is what I often encounter. I think there are more hermit crabs in my area than there are seashells! Small shells like these are not the only place you will find hermit crabs. I recently pulled up a beautiful big knobbed whelk with such an owner. I remember snorkelling once and finding some beautiful tritons and ceriths which I thought would be great to have for my collection. However, as I laid them out on the beach, each and every one of them got up and walked back into the sea! The hermits are everywhere! That’s fascinating and beautiful shells. I think I have some whelks amongst my shells. In temperate climates you don’t get so many hermit crabs (I’ve never seen one). There are more empty shells but these are not as large as tropical shells. You win some you lose some. Thank goodness for photography… that is how I “collect” nice shells for the most part. I’d never seen a hermit crab in the wild until I lived in Florida. Now I see too many! Imagine having to find a new home every so often just to stay alive.